According to local media reports, Taiwan is expanding the scope of its UAV surveillance operations on China. Taiwan is using unmanned surveillance drones to monitor possible missile launches in the Taiwanese strait has aimed across the Taiwan Strait, according to local news accounts. According to an article published in the Taipei Times, Taiwan’s military has begun expanding the deployment zone of its unmanned aerial vehicles (UAVs) from airspace over eastern and southern Taiwan to airspace over the Taiwan Strait. Consequentially, the report said that the UAVs can detect military movements along China’s coastal region. The Taipei Times cited an anonymous military official as the source for the report. A report in the Liberty Times, the Chinese-language sister site of the Taipei Times, quoted the military official as saying that the drones allow Taiwan’s military to “monitor China’s military movements in the southeastern coastal area,” according to the South China Morning Post. Taiwan has developed 32 indigenous surveillance drones for military use. The drones were produced by the National Chungshan Institute of Science and Technology under the direction of Taiwan’s Ministry of Defense. The National Chungshan Institute of Science and Technology is also believed to be developing a stealthy armed UAV variant. News reports have said that the armed UAV will boast “short wings, stealth features and a weapons cabin that can carry missiles and bombs.” It would also have radar absorbing paint. Currently, Taiwan’s military bases its drone fleet at a site in Taimali, Taitung County in southeastern Taiwan. All training exercises are carried out at this site, the Taipei Times report said. It added that the Taiwanese military is considering using a section of the Hengchun airport in Pingtung as a second UAV drone site. Pingtung is located in southwestern Taiwan, which would greatly enhance the UAVs ability to gather intelligence on the People Liberation Army’s (PLA) missile sites along the southeastern coast of China. 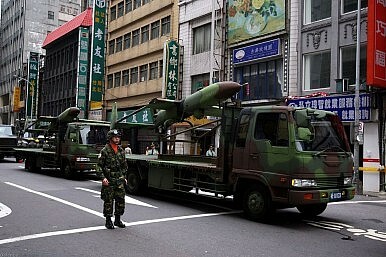 Despite the improvement in cross-Strait relations in recent years, China is believed to have around 2,000 missiles permanently aimed at Taiwan to deter it from declaring formal independence from the mainland. The Taipei Times report went on to say that the U.S. has expressed concern to Taiwan over how its drones are being deployed. Washington has asked Taiwan’s Ministry of National Defense to send specialists to Washington to brief their counterparts at the U.S. Department of Defense, according to the report. Still, Taiwan’s proximity to China could make the intelligence its UAVs gather on China’s military a huge asset to the United States. Before developing its own surveillance drones domestically, reports had suggested that Taiwan was interested in acquiring RQ-4 Global Hawk drones from the United States. Are Taiwan’s Citizens Willing to Fight Against China?6 Km From China, Taiwan's Kinmen Charts Its Own PathWhy Diplomatic Allies Matter to TaiwanWill the Trump Administration Send a US Aircraft Carrier Through the Taiwan Strait?Does China Have a ‘Blacklist’ of Taiwan ‘Separatists’?